Fake news is one major headline nowadays, and Facebook is at the heart of the happenings; even as its founder, Mark Zuckerberg has vowed to protect its integrity after finding 3,000 Russia-linked ads on the social network. While Facebook had employed several filters and enhancements in the news feed to fact-check on articles and warn readers on fake news. Now, the company has gone a step further with a new tool to help readers spot to fake news in context. 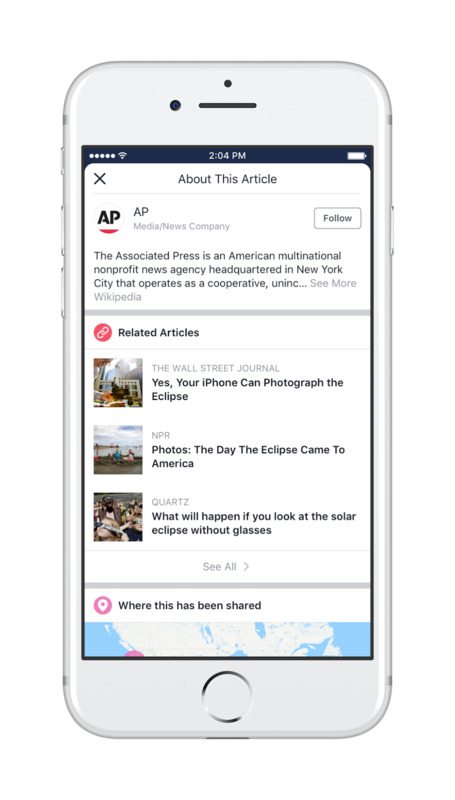 The tool provides context to any article posted on the Newsfeed, through a pop-up window showing details about the article and its publisher; with descriptions of the source of the article, details of the publisher, as well as other links. Albeit, the authorship is from crowd-sourced encyclopedia, mainly Wikipedia which can be edited by anyone, including those trying to spread hoaxes. But, nonetheless providing context will be a helpful tool to make sure users consider the source of any article been shared on the network. As the contextual information can help evaluate if articles are from a trustworthy publisher, and if the story is credible, which if no context is available, may suggest that it's fake-news site. And its coming on the heels of the fake-news storm surrounding the Las Vegas mass shooting, which Facebook escalated with the top sources of the stories pointing to websites like "TheAntiMedia.org" and "MyTodayTV.com, which if the context has been available, could have afforded readers means to know that those were not trusted sources.